It is a cold and rainy fall day here in good old North Dakota, so I felt the need to bake. 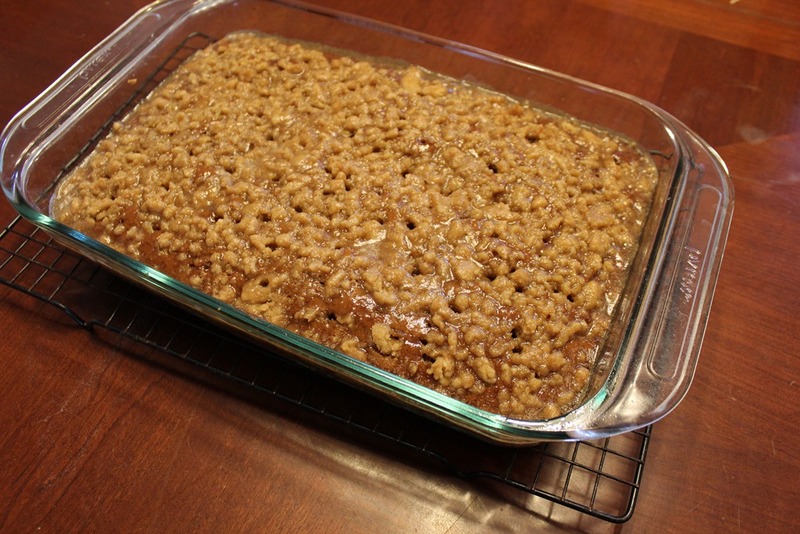 Well, I’m totally sick of baking with apples right now, so I broke out the pumpkin instead! 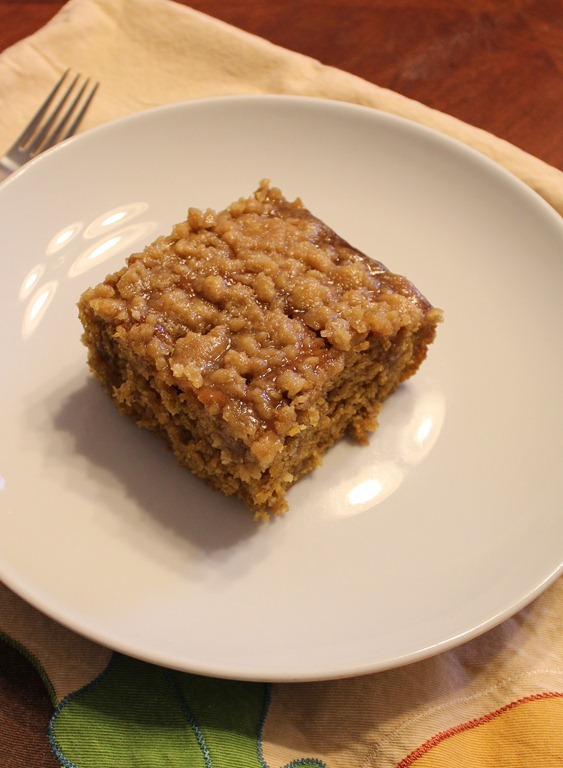 Nothing says fall more than breaking out the pumpkin and making a yummy treat with it. 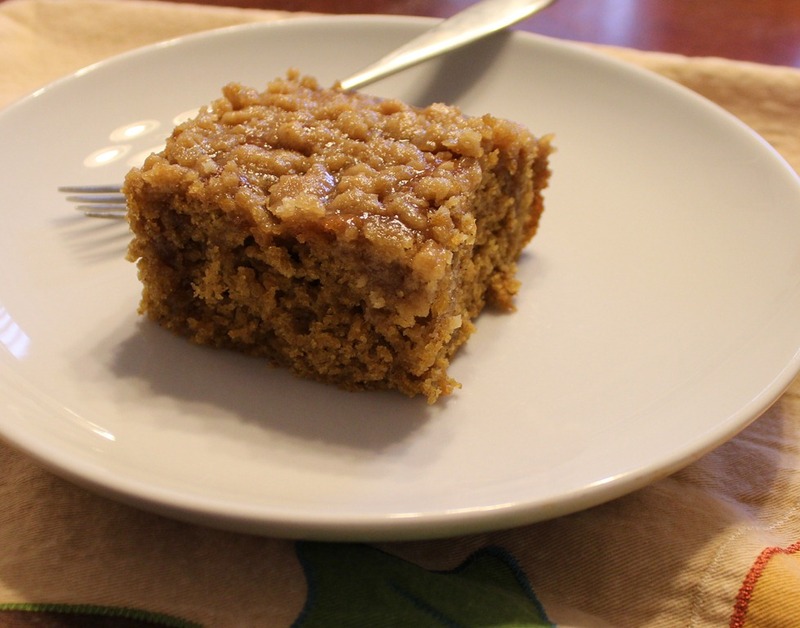 This pumpkin coffee cake recipe is super easy and fast to make. It uses a cake box mix (I use Arrowhead Mills Organic Vanilla Cake Mix…I’m not a fan of all the chemicals in the other box mixes). You can find this mix in all your major grocery stores. I used to buy it in Publix when we lived in Florida. Now this coffee cake is beyond rich and delicious and best served warm. On occasion I would make this coffee cake for friends in Florida, and they would eat the whole thing in just a few days and beg for more and the recipe. Well ladies, here is the recipe!! Preheat your oven to 350 degrees. 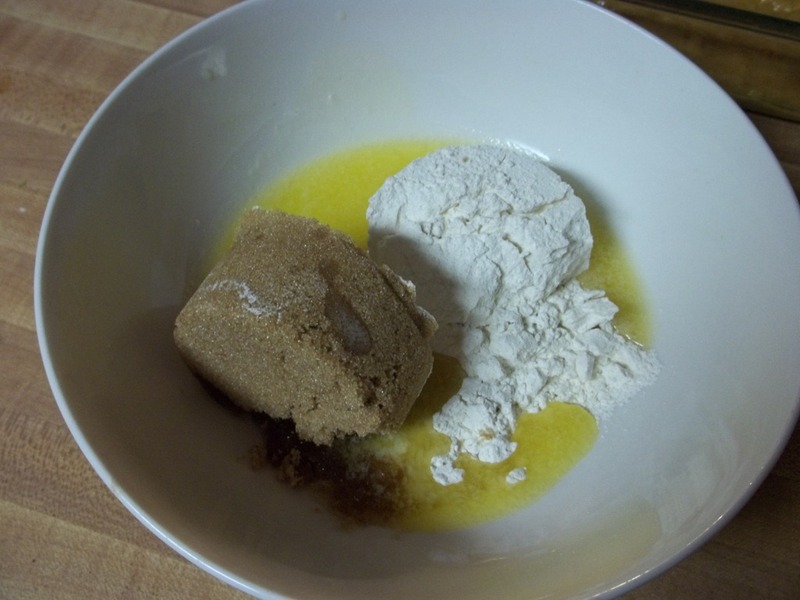 In a large mixing bowl add the oil, water, eggs, pureed pumpkin, 1 tsp of vanilla, pumpkin pie spice, and cinnamon. Mix until well combined. 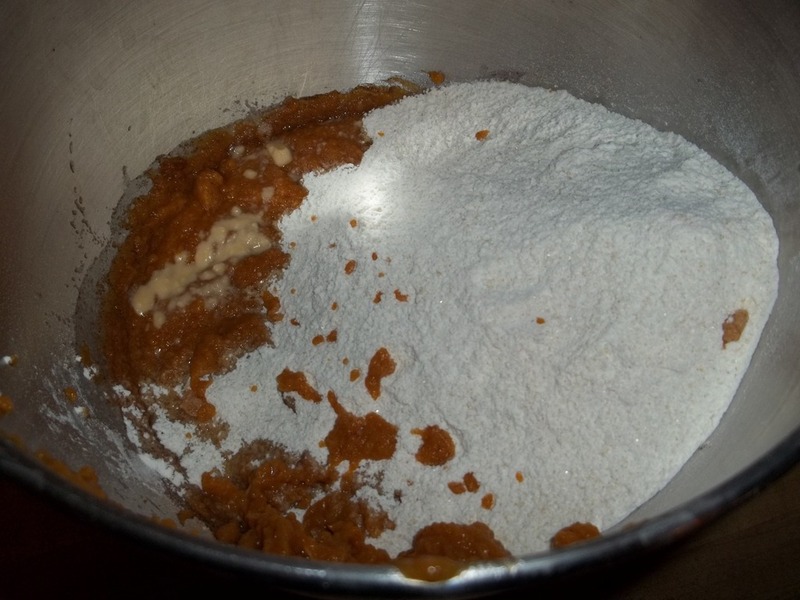 Then, add the cake mix and baking soda until combined. Don’t over mix. Grease a 9 x 13 pan and pour in the batter. In a small bowl, mix together the streusel topping ingredients. 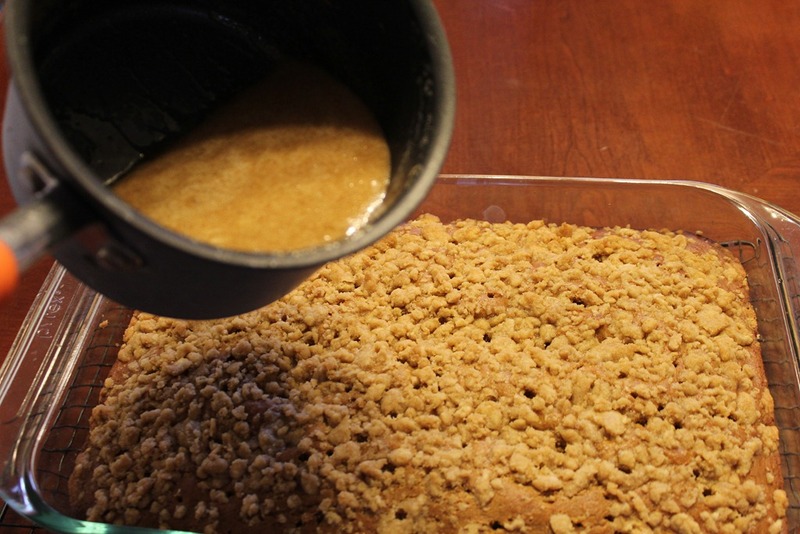 Using your fingers, sprinkle the streusel topping over the cake. Bake at 350 for 40-50 minutes, or until a toothpick comes out clean. 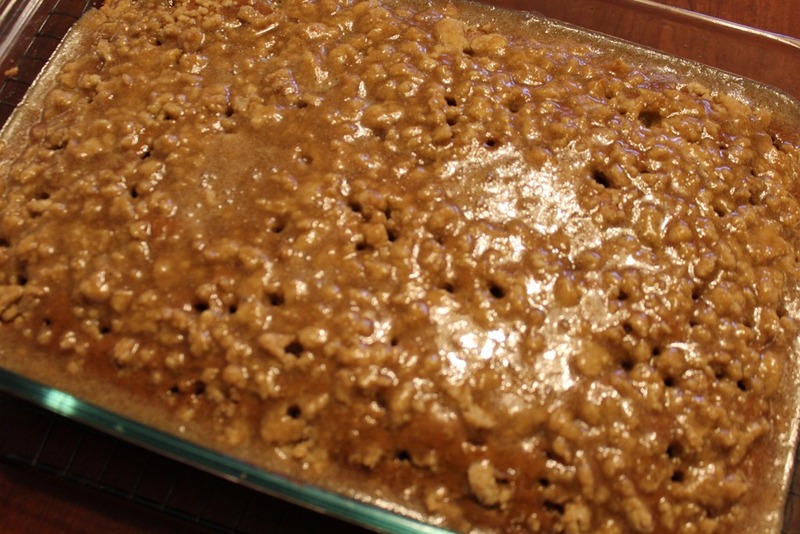 When the cake is almost finished baking make the caramel glaze. In a small sauce pan, over medium low heat, combine all the glaze ingredients. Bring the glaze to a simmer and then remove from the heat. Make sure all the sugar has dissolved. When the cake has finished baking, poke holes all over the top of the cake with a chop stick or toothpick a bunch of times. Pour the caramel glaze over the cake, making sure to cover the whole cake. Allow the glaze to soak into the cake. Once cooled eat up!!! 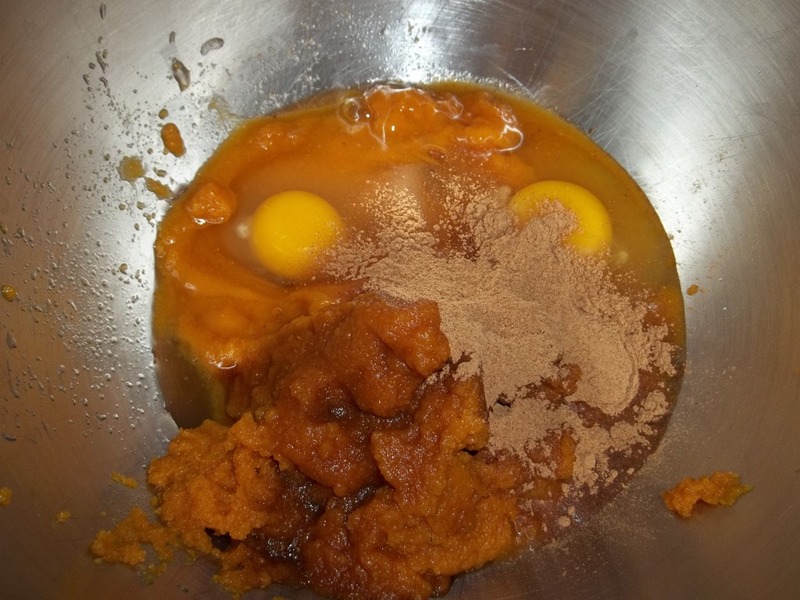 In a large mixing bowl add the oil, water, eggs, pureed pumpkin, 1 tsp of vanilla, pumpkin pie spice, and cinnamon. Mix until well combined. Then, add the cake mix and baking soda until combined. Don’t over mix. Grease a 9 x 13 pan and pour in the batter. 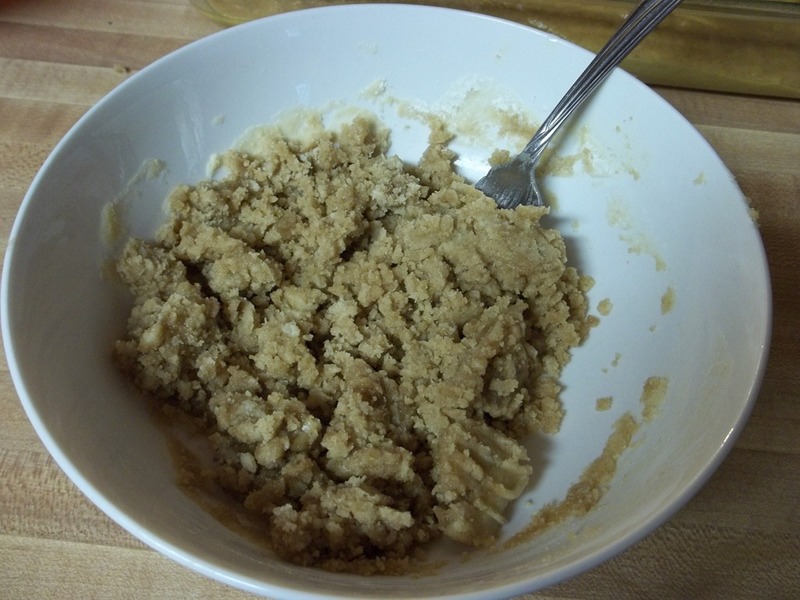 In a small bowl, mix together the streusel topping ingredients. 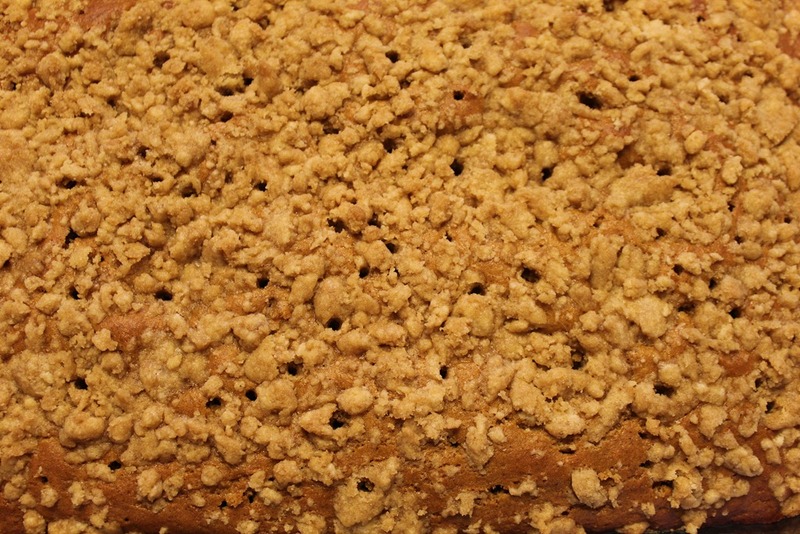 Using your fingers, sprinkle the streusel topping over the cake. Bake at 350 for 40-50 minutes, or until a toothpick comes out clean. When the cake has finished baking, poke holes all over the top of the cake with a chop stick or toothpick a bunch of times. When the cake is almost finished baking make the caramel glaze. In a small sauce pan, over medium low heat, combine all the glaze ingredients. Bring the glaze to a simmer and then remove from the heat. Make sure all the sugar has dissolved. 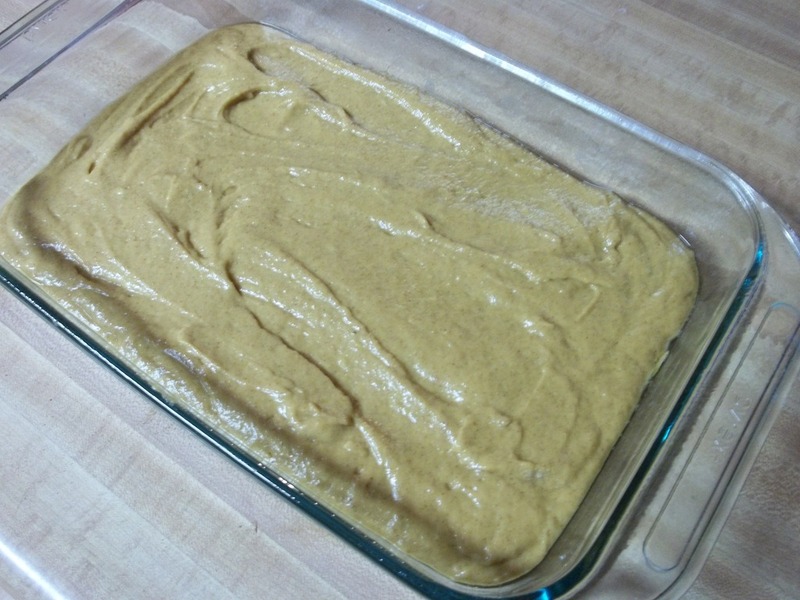 Pour the caramel glaze over the cake, making sure to cover the whole cake. Allow the glaze to soak into the cake. Once cooled eat up…although, it its best served warm!!! 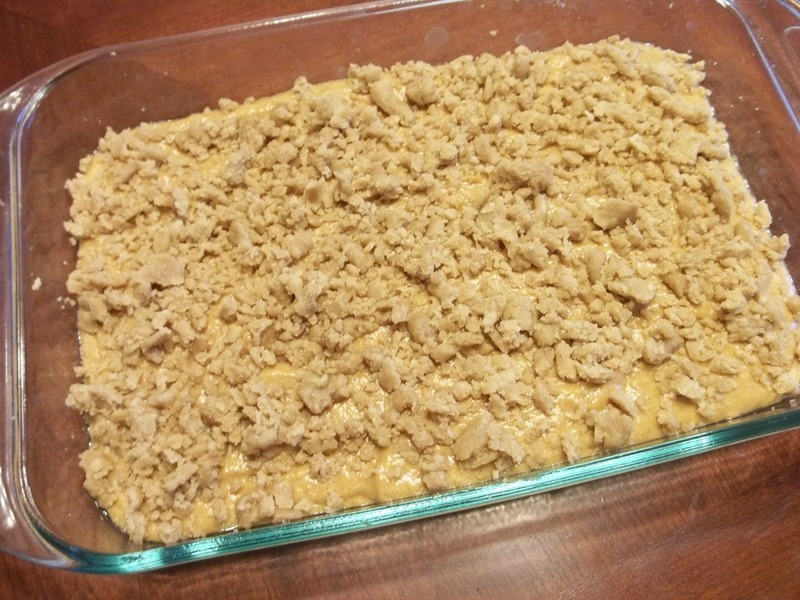 This entry was posted in Breakfast and tagged coffee cake, coffee cake recipe, pumpkin, pumpkin coffee cake, pumpkin coffee cake recipe, pumpkin streusel coffee cake on October 17, 2012 by fromfltond.